Compared to the more colorful denizens of our eastern deciduous forests (and many of the plants here at the garden), Bald Cypress in its subtle autumn raiment is a non-starter. But it provides a fine fall display when viewed in larger stands where it is native, and in winter the leafless trees stand out in all their sculptural splendor. 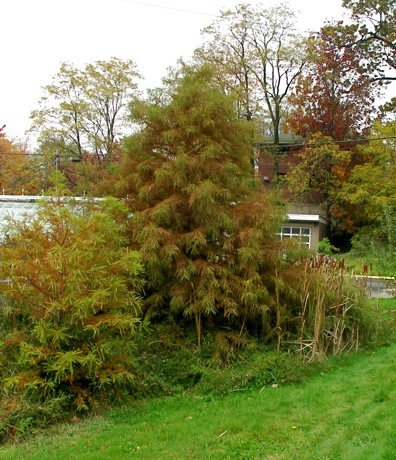 There are only a few species of deciduous conifers: 13 species of Larch (Larix), the Golden Larch (Pseudolarix), Dawn Redwood (Metasequoia), the Chinese Swamp Cypress (Glyptostrobus) and our plant, Taxodium, of which there are three species – maybe. Some botanists mush them together and make two categories of sub-species for the Mexican species and the Pond Cypress. Taxodium comes from the resemblance of the leaves to Yew foliage. The Yew genus is Taxus, to which is added the Greek word eidos, which means ‘resemblance, “ and then the whole thing is ‘Latinized.’ It’s a member of the Cypress family, Cupressaceae, along with about a hundred and thirty other species. Bald Cypress was formerly the dominant species for the great southeastern and southern lowland forests. There were some trees that grew to over a hundred and thirty feet tall. The lumber harvest from a hectare in the early days of ‘forest management’ was over a thousand cubic meters, while today a creditable 150 to 200 c.m. per hectare is common. The wood is rot resistant, long used for greenhouse construction as well as piers for docks and jetties. Lightweight but strong, with no soft-wood odor, it’s highly prized for its environmental stability. The shape is generally narrowly pyramidal, although some large crowns have been noted in some plantings, whether by environmental response or genetic disposition. A 70-foot tree will have a spread of around 30 feet, generally speaking. 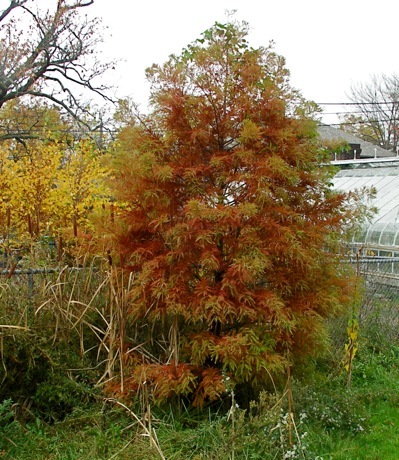 These two Bald Cypress show variability in growth rate and in fall color. Planted as foot-tall saplings at the same time five years ago, the one on the right is almost twenty feet tall, while the one on the left is about eight feet in height. The northernmost point for native stands of Bald Cypress is Trap Pond in Delaware, a canoeist’s delight. The tree is cold-hardy much farther north, but because young saplings are extremely susceptible to ice damage, a sustainable wild population is not possible in climates where ice often covers the flooded areas necessary for seed germination and initial growth. Interestingly, this tree is “exceptionally wind-firm,” as Dirr puts it, and will not be dislodged by even hurricane force winds. One note: although some coastal tidal inundation has been noted in some of the great stands of Bald Cypress, T. distichum is not suited to growing in brackish water. 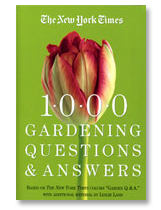 So avoid this tree in choosing plants for the ‘pond’ plantings along the shores of Rhode Island for instance. Disclaimer: This column is produced at infrequent intervals, and does not reflect the views of Yale University, Marsh Botanical Garden, or anyone else who works, worked or will work here.